Why image posts are grouped on Facebook timeline? Facebook’s timeline mechanisms tend to group image posts that were published within small timespans. If you would like your photos to not be grouped and appear individually, please use larger timespans (at least couple hours). Unfortunately, we have no control over that mechanism, as it is internal Facebook behaviour. Why are my Facebook posts only visible to me? How can I change this? My posts are going out at the wrong time. That is usually caused by the timezone being incorrect. You can setup your main timezone at settings page, or individually for each scheduled post (when you schedule it). If the same post will be scheduled to multiple accounts, will it be considered as a one post? No, the number of pending post is multiplied by the number of social media profiles that you are scheduling it to. So when you are scheduling the same post to Facebook, Twitter, and LinkedIn it will be counted as 3 posts. How will my link attached to the post look like? My link preview is not generated. Link preview looks different than it should. Your attached link is handled just like the one added directly to the social media platform. You can check exactly how different social media will handle the link preview and description, and also force some of the social media sites to fetch updated information than the cached one. Facebook – You can post your link into the Facebook Crawler Debugger to fetch new updated information from the site and see the generated preview. If your link preview is generated from the old, cached data, usually the only way is to wait few hours before the platform will fetch new data from the link automatically. How do I get the Postfity button/the extension in my browser? Can I tag someone / business page in the post? Can I use “@” to tag someone? It is possible to tag people and pages when posting on selected social media platforms. Facebook – You can tag someone in the post easily with Facebook. Just type in “@”, start typing the name and the pop-up with available pages and profiles will be displayed. Click on the desired name to tag. Instagram – When posting to Instagram you can tag someone by writing “@username”. When you will get your notification on your phone, paste in the description from your clipboard and make sure that the “@username” is highlighted. If not – delete the last character of the username and there should a pop-up appear to select a person to tag. Can I setup my own publishing hours for “Add to queue” option? Yes, you can. 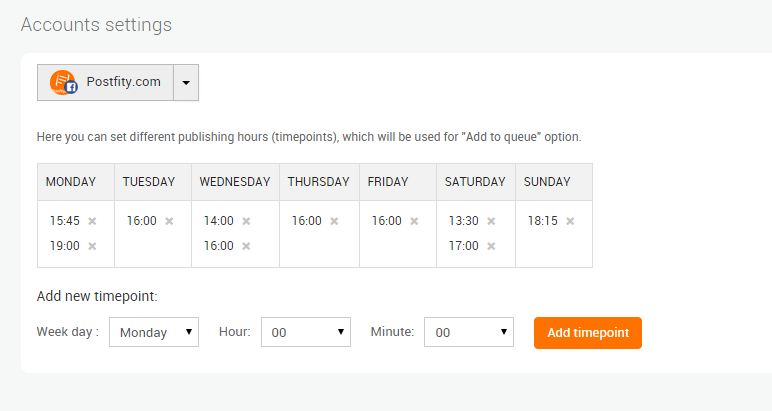 Go to settings page and there are options for setting up queue publishing hours, which we call “Timepoints”. You can setup your own timepoints for each of connected profiles/pages/accounts! Can I post to events on Facebook? Currently, we only support posting to private profiles, pages that you have admin rights to, and groups that you have admin rights to. Are there any limits per day/month in terms of scheduled posts? No. The only limitation is the number of posts saved in the queue. If you will empty your queue quickly (for example schedule all 100 posts from Basic account limit in just one hour), you can easily schedule another 100 posts for the next hour etc. Basically, you can post multiple times more posts daily than the pending post limit of the account – you just need to keep adding them to the queue.